Our unique approach helps you transform legacy apps to accelerate your cloud-native journey and go fast, forever. Evolving customer demands force companies to innovate quickly. However, most of the world’s developers work with legacy applications that reside on an outdated platform using antiquated tools. Moving to the cloud is often hindered by a complex application portfolio that is tightly-coupled and sparsely documented. On top of all that, organizations are impeded by manual, tedious processes designed to minimize risk and maintain compliance. As a result, software releases become infrequent and time consuming. We can help! 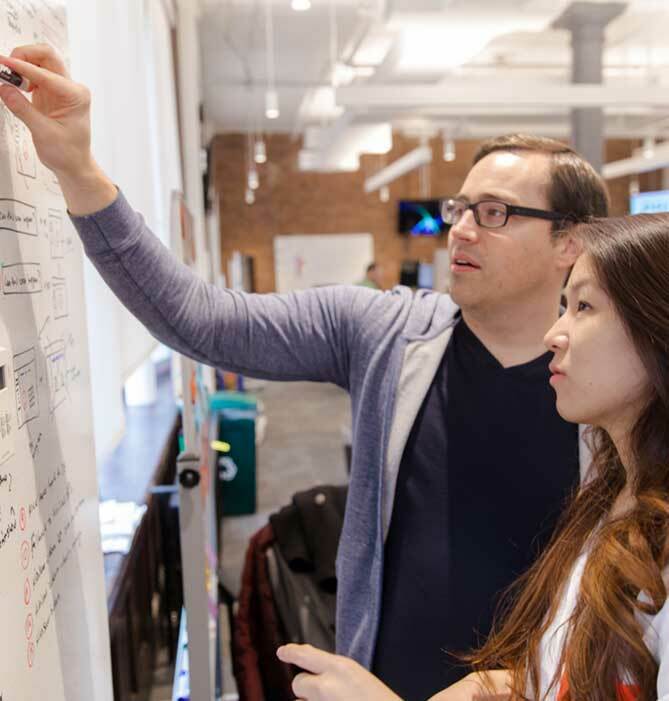 Pivotal’s Application Transformation Services help you navigate the journey to the cloud, infusing confidence into every step of the journey. Our team will work alongside you to transform your legacy portfolio to cloud-native to incrementally reduce time, cost, and operational inefficiencies while maintaining security, resilience, and compliance. We help large organizations plan and execute their application transformation initiatives by using an approach that defines measured, incremental steps that gradually increase the cloud maturity of your app portfolio, the automation in your software development lifecycle (SDLC), and the knowledge within your team. 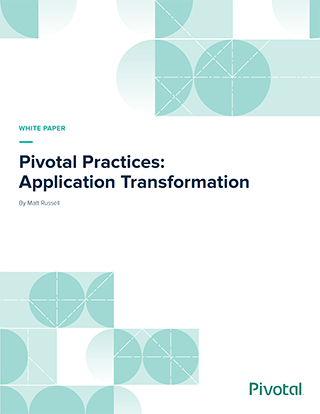 Pivotal defines three phases of app transformation to cloud-native: replatforming, modernization, and organization transformation. The cloud maturity of your app portfolio, as measured using ​15 technical factors​, gradually increases during each phase. Your existing apps running on current-era stacks supported by time-tested people and processes. Replatforming involves moving a small set of existing applications to the new platform. The effort required to migrate these applications should be low to moderate. However, replatformed apps often do not yet comply with all ​15 factors​. Suitable apps moved to PCF with minimal code change. Better ops thanks to platform automation. During modernization, the level of cloud maturity of replatformed apps increases while larger and more complex apps are also transformed. More complex, nonfunctional requirements like performance, security, and compliance will be met during modernization. Existing apps refactored using 12-factor principles and modern software process (TDD, CI/CD), optimized for PCF. Organization transformation reconfigures your organization by forming small, balanced teams which deliver software products from idea to production. Cross-functional teams delivering continuous software updates into PCF end-to-end through modern principles. We recommend starting with a set of 5-10 applications built over the last five years using technology compatible with Pivotal Cloud Foundry (PCF). We use an approach called Snap Not Analysis Paralysis (SNAP) to quickly determine suitability and a TIME Analysis, “2 x 2” business prioritization framework used as a conference room exercise to help target apps of low technical risk and of high business relevance. We help you form an internal consulting function around app transformation and then augment internal staff (who own and lead the initiative) with external resources (that can scale and offer economic advantage) in a way that ramps over time. The objective is to get 5-10 applications moved into production while capturing lessons/techniques as recipes to streamline and accelerate future efforts. Complex systems are broken down into lightweight microservices that can scale horizontally on a cloud. These monoliths often span multiple subsystems and data sources and dozens of deployables across a network of servers and mainframe backends. Monoliths often also contain elements that cannot move to the cloud without a complete rewrite. To start, we recommend drawing a ​value stream map​ of the end-to-end path to production (for the initial apps only) to identify opportunities to reduce waste through automation. Additionally, there may be little to no automated test coverage within the existing portfolio. Pivotal recommends that all new code be written to include unit and integration tests. Existing code ported to PCF should include smoke tests for backing services, and potentially acceptance tests. Improved operational metrics for transitioned apps: MTTR, MTBD, support tickets, etc. Enhanced security: Faster patching, zero downtime upgrades, etc. Your legacy portfolio can be gradually transformed to cloud-native in order to incrementally reduce time, cost, and operational inefficiencies while maintaining security, resilience, and compliance. We've helped many customers migrate their software to the cloud over the years and as a result have honed in on the patterns and techniques we believe work best.